This is a classic Italian recipe with a colourful sauce and history the simple ingredients make it quick and easy to make google the name the history of the dish is fascinating. Cook the spaghetti in salted, boiling water until al dente. Meanwhile fry the garlic, capers, olives, anchovies, chiles, and oregano in a little olive oil for a few minutes. Add the tomatoes, bring to a simmer, and continue to cook for 4 or 5 minutes, until you have a lovely tomato sauce consistency. 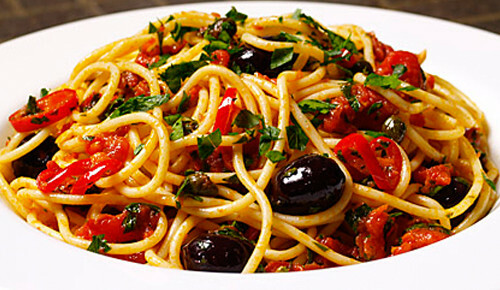 Remove from the heat, plunge the drained spaghetti into it, toss it over, and cover with the sauce. Rip all the basil over it, correct the seasoning, and drizzle with good extra-virgin olive oil. Serve with shaved Parmessan Cheese.